Whether at a park, a child care center, or a school, playgrounds with outdoor play equipment offer kids a fun space to get exercise and enjoy some fresh air. But did you know that, according to the National Program for Playground Safety, more than 200,000 children are treated for playground-related injuries every year? Fortunately, most of these injuries are preventable. Here are some safety tips to keep in mind to ensure that time spent at the playground isn’t derailed by injury. Supervise: Adult supervision can help prevent many of the common injuries that occur on playgrounds. Be sure that the children you are responsible for are within sight at all times and that you are aware of any blind spots. Teach proper use of equiptment: Kids are creative, and they have a real knack for finding new ways of using playground equipment that don’t always fit with manufacturer guidelines or intentions. Instruct children on the proper way to use playground equipment to ensure their safety. Also, be sure that the equipment on which the children are playing is age appropriate. A good playground should have separate areas with appropriately sized equipment for children aged 2-5 and children aged 5-12. 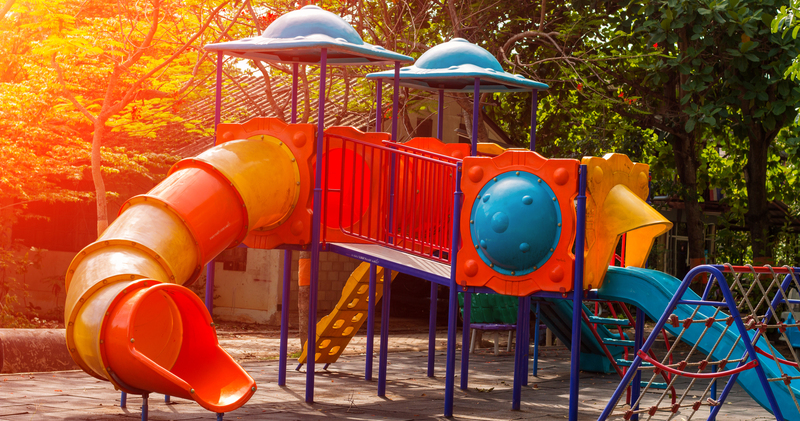 Survey the premises: Check for loose screws, protruding hardware, sharp points, and splintering on playground equipment that may snag or cut a child. It is also a good idea to inspect the ground around the playground for sharp objects, such as broken glass or nails, that children may step on. Play nice: Pushing, shoving, crowding, and roughhousing on playground equipment can be dangerous, especially when it occurs at elevated heights. Teach children to be respectful of others and take turns on equipment. Evaluate surfaces: Falls are the most common source of injury on playgrounds. Choose playgrounds that feature shock-absorbing surfaces (such as mulch, sand, shredded tire, or rubber mats) under and around playground equipment, and avoid any playground equipment over eight feet in height. Be prepared: Minor cuts, scrapes, and abrasions are all too common at playgrounds, so it is a good idea to keep a small first aid kit on hand. Also, avoid having children wear clothing or outerwear with drawstrings, necklaces, purses, or loose scarves to avoid strangulation hazards.